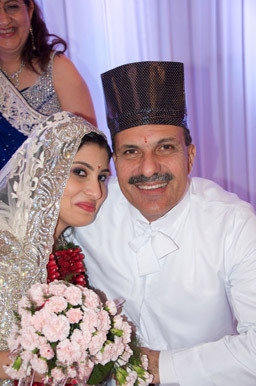 According to the Zoroastrian scriptures, marriage is an institution favored by Ahura Mazda (Almighty God – the Lord of Wisdom), who says, "Oh Spitama Zarathushtra! Indeed I recommend hereunto thee, a man with a wife above an unmarried man, a man with a family above one without a family, a man with children above one who is without children." The nuptial ceremony is preceded by several other ceremonies and rituals, the first of course, being the Betrothal also known as "Rupia peravanu". Shortly after the bride accepted the groom's proposal, an auspicious day was selected for the Betrothal Ceremony, and on that day gifts were exchanged between the families. The next ceremony called "Madhavsaro" is where the families of the bride and groom each plant a young tree at the entrance of the home, along with prayers by the priest. The next ceremonial occasion was that of the "Divo", or lighting of the lamp. The ceremonial lighting of the lamp puts the families' final seals of approval on the Betrothal! The third ceremony before the wedding is called the "Adarni". The family members of the groom visit the home of the bride to present gifts for the wedding like clothes and jewelry. Friends and members of the family are invited to celebrate with the traditional meal of dahi, sev and sweets. Another ceremony called "Supra nu muhrat" is sometimes performed a day before the wedding. Four married women gives a supra containing things like, supari, haldi, paan and coconut to each other seven times singing a ritual song. Before the marriage ceremony, the bride and groom are required to undergo a sacred and ritual purificatory bath with consecrated water. This bath is known as the "nahan". The bride and groom are then in a state of ritual purity, and ready to receive the blessings and strength from the divine world. The bride's mother performs the ritual known as "Achumichu" when the groom steps up on the stage. She holds a tray containing supari, rice, egg, dry fruits and coconut and circles the tray seven times around the groom's head and breaks the egg and coconut near the feet of the groom. After that the bride steps up on the stage and the same ritual is performed by her future mother-in-law. The marriage ceremony itself is generally performed after sunset. It is an event which has to be celebrated, not quietly, but with some fanfare and in the presence of an assembly or "anjuman", which bears witness to the event. The groom wears white trousers with the traditional Iranian overcoat or "dugli", also white in color, and carries a shawl over his arm. 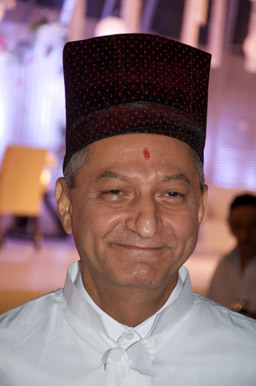 On his head he wears a traditional parsi "pughree" or "pheta". The bride wears a white sari embroidered in white and silver. Both the brothers, or nearest male relatives, of the bride and groom, also dressed in traditional garb, officiate as witnesses to the wedding. In Zoroastrianism, white is the color symbolizing purity, and therefore, most of the celebrants and members of the family are dressed in white. 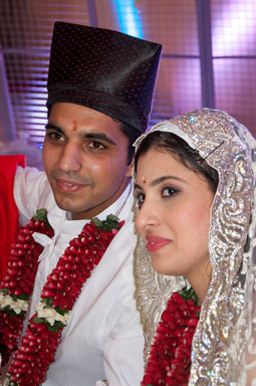 Both the bride and the groom have a "tilak", a mark made with a red pigment, on their foreheads. The bride groom's mark is a long vertical one, symbolizing the rays of the sun, whereas the bride's is round, symbolizing the moon. Just as the sun is a fructifying agent and the moon a conceiving one, so is the man's relationship to his wife. The couple now takes their place on the stage which, in addition to the chairs, holds two tables with trays containing rice, and most importantly, the fire urn. The bride and groom first sit facing each other. The witnesses of both the bride and groom will hold a sheet between them. The officiating priest takes the right hand of the groom and makes him hold the right hand of the bride, under the sheet. A cotton thread is then wound three times around the hands of the couple, and some rice is placed in the left hand of the bride and groom. Another cotton thread is wound seven times around the couple. During this time the priest recites the "Ahunavar" prayer, the most sacred of all Zoroastrian prayers, the vibrations of which are said to be identical to those at the creation of the universe. At a signal from the priest, by placing some incense on the fire, the cloth held by the witnesses is dropped, and the bride and groom throw the rice held in their left hands at each other. The one who throws the rice first is said to win the race of love, and will be the foremost one in loving and respecting the other. The throwing of the rice, or some other grain, as a symbol of good luck comes down to us from time immemorial. According to the "Shah Nameh" or Book of Kings, this ritual was first performed at the nuptials of Zal and Rhodabeh, whose son Rustom became Iran's national hero of heroes. The couple now move their chairs and sit side by side facing east, the direction of the rising sun. The dropping of the cloth between them and their sitting side by side represents the end of the separation between them and their joining together in matrimony. The sacred and most important part of the marriage ceremony now commences with the invocation of the Lord's Blessing. "May the Creator, the Omniscient Lord, grant you a progeny of sons and grandsons, plenty of means to provide yourselves with a heart ravishing friendship, bodily strength, a long life and an existence of one hundred and fifty years." The two priests then exchange rice with a ritual handshake and begin to chant the ancient marriage benediction known as the "Ashirwad" followed by the Tandarosti. "May you both have light, glory, strength, health, victory, wealth that may Ahura Mazda give you both great happiness, blessed children with innate wisdom, long life and a brilliant happy paradise which is due to the pious. May it be so as I wish". The couple are now man and wife.